From a distance, He Heng had noticed the entourage in the garden but they were too far away for him to identify them. Although he could not see very clearly, the movements of the woman at the front of the entourage seemed unfamiliar. “Ming He, can you see who is it?” He Heng questioned. He had just return from the royal courts and did not want to waste his energy dealing with a bunch of chattering women. Having said that, He Heng stopped his advancement and waited for a reply, his expression turning darker by the moment. Even though Ming He did not believe his eyes and what he was saying, who else other than the Prince Consort would dare walk in front of the Side Consorts? At the mention of Prince Consort, He Heng remembered that woman with a weak personality, whose father was the Duke of Chang De, and maternal uncle was the Xiang Qing Marquis and held the a high position in the Supreme Justice of the Court. With her upbringing, it was no wonder that there was little opposition when his royal consort mother chose this Madam Qu as his wife. Qu Qing Ju spotted a figure in the distance, one that the original feared - the Prince of Duan. Appearance wise the Prince of Duan was somewhere in his twenties. His stature tall and was posture good. The white robe he wore was edged in black and overlay with a white jade cornet, exuding the impression of a lofty personality who stood above others, a dragon among men. As her entourage approached nearer, Qu Qing Ju noticed that although the Prince of Duan was smiling, there was no mirth in his eyes. When they had arrived where the Prince of Duan was Qu Qing Ju curtsied and smiled, "Greetings to Your Highness, have you just returned from the royal courts?" He Heng's gaze landed on Qu Qing Ju delicate wrist which was a contrast against the blood red bracelet she was wearing, giving the illusion that it would break at the slightest touch. "Has my Prince Consort already recovered?" "Yes, it is all thanks to Your Highness's good fortune," Qu Qing Ju smiled wryly as she used a handkerchief to wipe at the imaginary sweat on her forehead. "After this bout of illness and my weak body constitution, the imperial doctors had actually advised on a light diet. Who would have expected that the kitchen servants would only pay lip service and prepare greasy and oily foods, all of which are what the imperial doctors advised against. Hence, I was so angry that I punished them." At the mention of the incident, Side Consort Jiang, Jiang Yong Yu, sneaked a peek at the Prince of Duan curious as what his reaction would be. What she saw was a nonchalant prince that did not react to the matter, as if it were something insignificant. 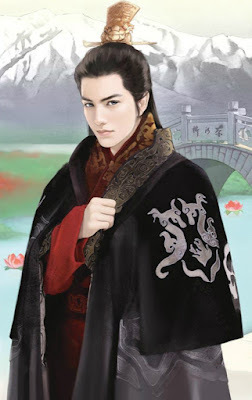 While He Heng did not care to bother himself with such insignificant details, he was surprised by his Prince Consort's boldness and being able to order the servants and actually managed to carry out a punishment. He might not have any feelings towards this Prince Consort of his, but he would give her respect where it was due and would not embarrass her unnecessarily. She was after all, his main wife, and someone who was supposed to manage the household. So he nonchalantly concurred and replied, "Servants who are not faithful and obedient should be thrown out." In response, Qu Qing Ju replied, "Your Highness's consideration is of great fortune to this wife." If she was correct, that the Prince of Duan had a personality of being ambitious and well-controlled. Before she transmigrated, in her previous life, Qu Qing Ju could have been considered a successful judge of character. So what kind of man had she not seen before? Besides, this Prince of Duan was not stunningly gorgeous in her eyes, so she couldn't care less. When He Heng saw that the other party had not intentions of continuing the conversation, he looked at the other women in the entourage. He noticed that although Consort Feng's face held a smile, it was stiff and it would seem that she had been insulted. He looked back to his Prince Consort, who lowered her head once his gaze was on her. In the end, He Heng only nodded his head and said, "Since you have recovered, it would be beneficial for your to have some exercise and fresh air outside." With that said he made his way back to his study room. The moment He Heng left, Qu Qing Ju turned around and looked at Consort Feng wryly. She stretched out her right hand and tilted Consort Feng's chin upwards, and while rubbing the flawless chin, Qu Qing Ju used a gentle tone and said, "This face of Consort Feng, the more one looks at it, the more one seems to fall in love with it." This movement made Consort Feng shudder and she retreated away from Qu Qing Ju. After touching Consort Feng's face, Qu Qing Ju used a handkerchief to wipe her thumb and index finger, the digits that were used to grasp and tilt Consort Feng's face. Once done she held on to Jin Zhan's hand be before she left, said, "That's ok. I am tired. You all may leave now." Consort Feng looked at the handkerchief which had been used by Qu Qing Ju to wipe her hand after touching her face. It was now on the ground, 3 steps away from her, mocking her. Her smile was frozen in anger and humiliation. What made her angrier was that she was actually intimidated by the Prince Consort's gaze! How dare such a dull, timid woman treat her like this?!! To make matters even more worse was that the other 3 concubines were actually laughing at her right now. Her expression darkened, her icy gaze swept across them, retorting, " What are you looking at? There is nothing to see. Leave immediately!." The two lower ranked concubines curtsied to Consort Feng before leaving. However, before they could leave, Consort Jiang, Jiang Yong Yu, wanted to show her authority and magnanimity said, "Little sister concubines should return to your rooms early. I will take my leave first." Without a second glance to see Consort Feng's expression, Consort Jiang left. Gritting her teeth and mincing her words, Consort Feng stomped on the fallen handkerchief and exclaimed with a dark expression, "Qu Qing Ju!!"